This most versatile "Basic" CSF-3XL cat/small-animal Super Feeder for cats and other small animals comes with an additional 1.5 gallon hopper (about 5 lbs of kibbles--dry or slightly moist). 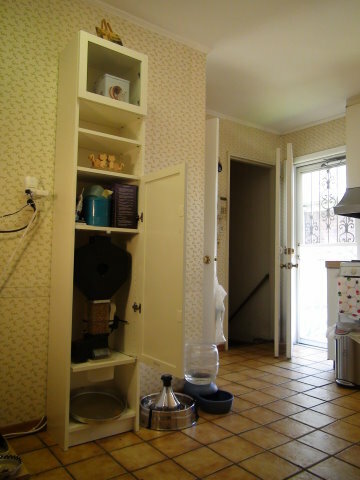 All PVC Down-Piping shown is only a mounting/installation example shared by a past customer and is not supplied. 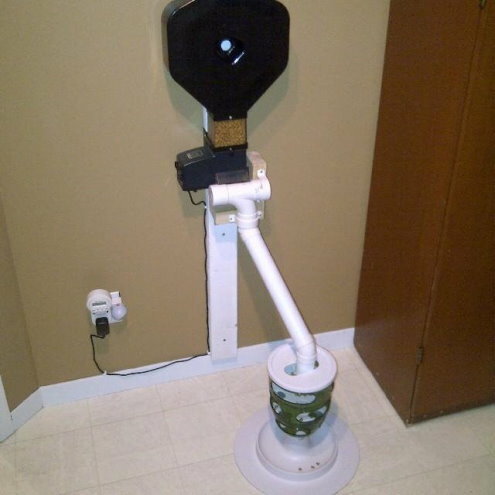 This "Basic" package comes with an indoor type power supply (plugs into just about any lamp timer) fitted with a 6 Foot cord and jack plug, mounting hardware, two clear 2-Cup hopper extensions (shown with only one installed), hardware and instructions. 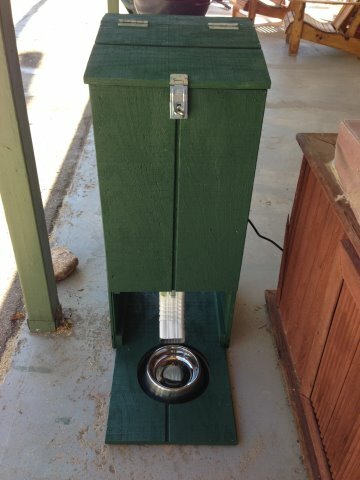 Feeding time (portion size) cycle is fully adjustable with feeder's own internal electronic timer. To power and trigger it, choose a suitable external timer to program feed times. Any basic lamp timer will do, or you may use a digital timer for best time accuracy. If you do not already have a timer of some sorts, to save cost we suggest purchasing combo 20 or 21 (indoor power supply/timer type) or 23, 23A (outdoor power supply/timer type). This "basic" package does not come with an external timer, but you can use any timer of your own to trigger it. If a 120V power source is not available, you may even use any of our 6-24V timers or purchase a battery combo to use your own 12V power source (some wiring required). CSF-3XL OVERALL SIZE: 12 inches wide x 11 inches D x 22 inches tall ready to mount to a 2x4 on wall or other means. 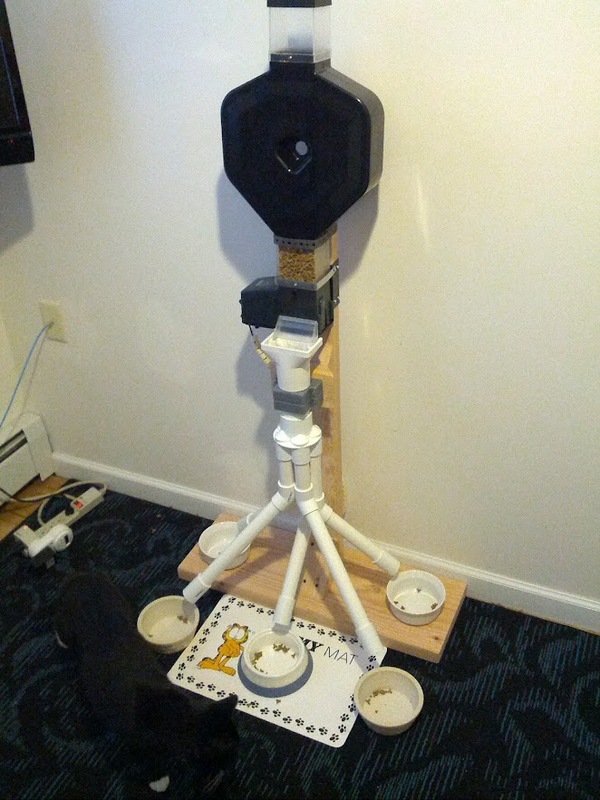 GREAT ON COVERED BACK-PORCH FOR OUTDOOR CAT FEEDING BY MOUNTING TO WOOD POST, OR MAKE YOUR OWN WOOD MOUNT AND PLATFORM. 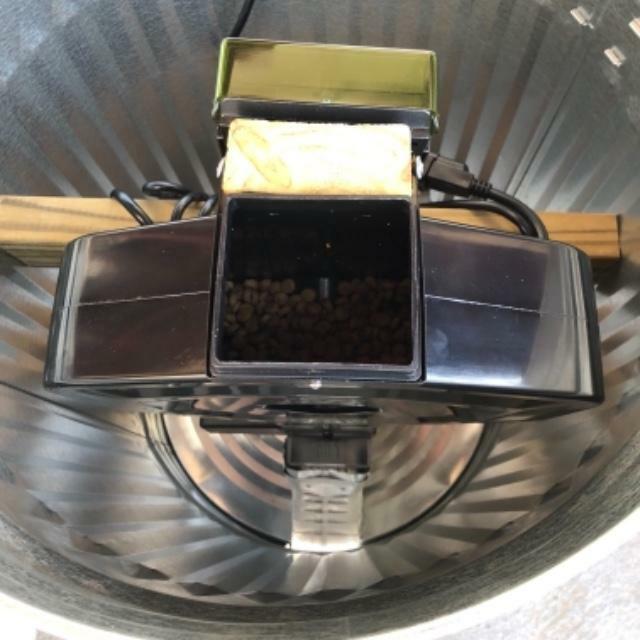 IMPORTANT NOTE: IF PLANNING ON INSTALLING THIS FEEDER OUTDOORS, MAKE SURE YOU ADEQUATELY PROTECT AT LEAST THE CHUTE AREA WHERE THE FOOD COMES OUT AND ITS SUPPLIED INDOOR POWER SUPPLY (ALL BOXED-IN IS BEST). IF YOU HAVE RACCOONS, YOU MUST DO THAT. Voltage required: An indoor type power supply is included 110-240VAC 50-60Hz 12VDC output--USA style plugs only-not battery operated. 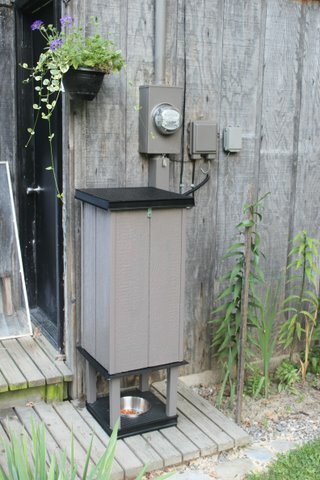 An outdoor power supply is also available if needed. In "super feeder accessories" of this store, a Euro or AU power supply may be available. This package deal will require some simple handyman work and parts available from Lowe's, Home Depot, etc...Use your own imagination! The TP-LINK HS100 Smart Wi-Fi Plug is perfect to control your Super Feeder® remotely for up to 15 meals/snacks per day. It is one of the easiest we tested to install and use. Just follow directions included with the Smart Wi-Fi Plug. All you will need to do once installed is program suggested 2 minutes of "on" time for each feed cycle time of day you want. Make sure you program "on" and "off" time, i.e. 8:00 AM and off at 8:02 AM for each time of day you want to feed your pet. Also select all or certain days of the week you want to trigger your Super Feeder® to feed your pet. The feeder runs only for time in seconds you previously adjusted the feeder to give you the portion needed and then stops. You may of course trigger your Super Feeder® anytime by remotely turning it on for a few seconds and turning it back off yourself from your device. You may install and operate several Wi-Fi Plugs and feeders simultaneously in different places within range of local Wi-Fi. Note: The feeder must have been powered down for at least 2 minutes between feed cycles to assure it triggers again. 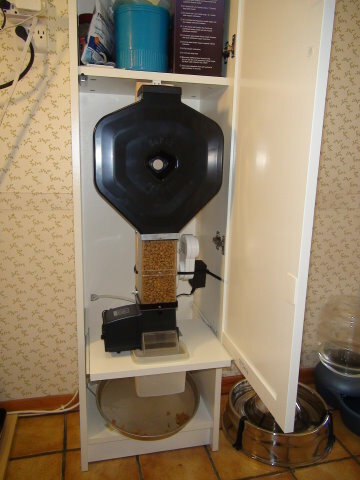 If it has not been off long enough like repeatedly turning it on and off, the feeder will not work, which is normal. You could also control the Super Feeder® by voice command using this TP-LINK Smart Plug compatible with Amazon Alexa®. 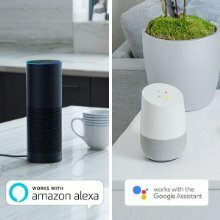 The TP-Link Camera could be a great addition. Many ways to operate your Super Feeder®. This is what makes The Super Feeder® so unique! Very happy with this feeder. It was easy to set up. Love that I was able to mount this one on a 4x4 post, raise it from the ground and add a section of eavestrough to keep the raccoons out of it. 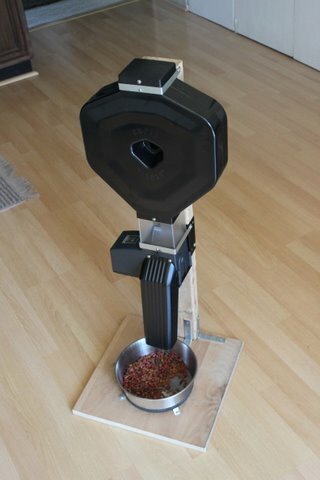 Using a large cat food and no difficulty dispensing it. It is much better than other brands I have purchased in the past. This is the quality one to buy. I just now put it together. That was a bit of a challenge to an older person with poor eyesight and reduced dexterity- but you can tell it is quality made. In the past I wasted money on one of the junky things from Petco that hasn't been worth the investment. Thank you for making this product- would recommend to others. Fourth one I've bought ! I have bought four of these over the years. Not because they wear out. The first one I bought years ago for my koi pond, it's still in service. Three more as we've added cats to the household. Reliable product and fast service. 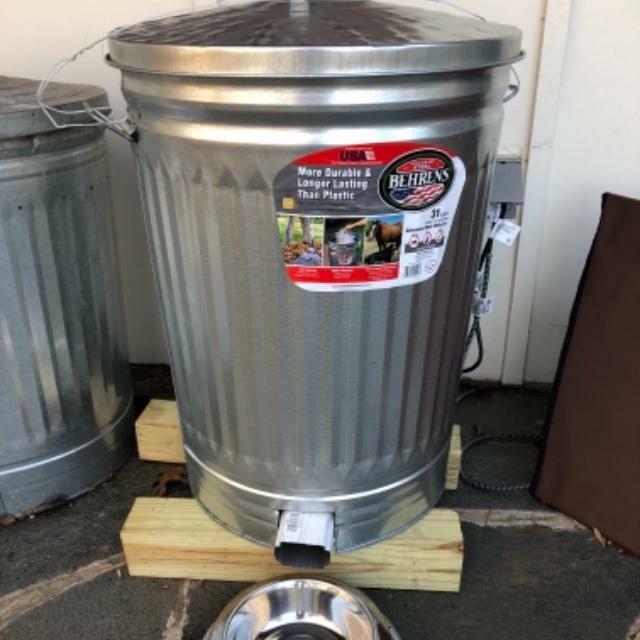 Works great for dogs, too, as long as you can find a small bites food! We occasionally need to leave our dog in an indoor/outdoor kennel for a few days at a time while we are out of town. For years I have used food bowls with rotating tops to make sure that he still gets fed while we're gone, but the system was pretty bad. Between the two bowls we could leave him for a couple of days, but one bowl fed him every 12 hours and the other fed him every 24 hours, and since we needed two compartments' worth of food to match one serving, it was pretty goofy. Recently, his one brain cell realized that he could pry the lids off the bowls, and that was the end of that. 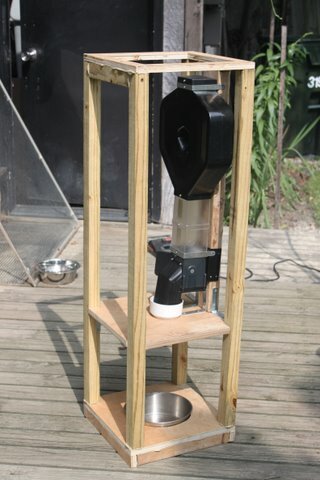 We searched online for a long time to try and find some automated feeder systems that would work for 3 or more days, could be mounted outside of his kennel area to protect the food from his reach, and would dispense accurately. All the reviews for this product fit the bill, so long as we could find a small bites version of his food. Eventually, we did - a Nutro small bites Lamb and Rice that has almost the exact same diameter as the cat food mentioned in the specs for this unit. The instructions were easy to understand, and with the flap set to its maximum opening, and the duration to maximum, he gets one serving each time the feeder runs. (approximately 1.25 - 1.5 cups) We couldn't be happier!